What is the Shreemad ­­Purushartha Grantharaj? 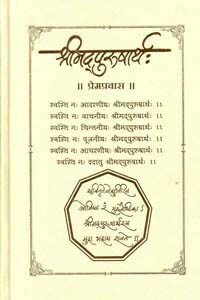 For the love of his shraddhavaan friends, Sadguru Aniruddha Bapu composed the (three volumes) Shreemad Purushartha Grantharaj. These Grantha’s (holy scriptures) will permanently serve as the guiding light in the lives of shraddhavans. Sadguru Aniruddha Bapu has said that the “Shreemad Purushartha” is his Yadnya (ritual of offering made with a purpose) to eliminate darkness. He further says that he has collected this honey from the blossom that stemmed from the contemplations of several seers, sages, teachers, saints, great philosophers and even those of the common man. He then poured this into the hive that is the “Shreemad Purushartha” He has left this hive open, for each being who wishes to enjoy its taste and medicinal properties. What was the purpose of writing the Shreemad Purushartha Grantharaj? Bapu composed the Shreemad Purushartha Grantharaj so that every shraddhavan can walk on the path of Devayan Pantha (religious good) to enable them to happily pursue family life and spirituality. It is one of the points from Bapu’s 13 Point Program and he has composed these three Grantha. The three Grantha are the Maargadarshak(guide) Gurus for every human being, so that they can live their life successfully and confidently. 1.Satya Pravesh – Extreme quietism or worldly egocentric behaviour, both types of solitude cause an imbalance in an individual’s life as well as in the society. Only the Maryada marg (path of discipline) that offers balance, can help achieve the Parmeshwar’s (Almighty) treasures. Sadguru Bapu has introduced the Maryada marg in this Grantha using very simple words and examples. To make man’s sacred journey blissful, it is required for one to keep seeking the ultimate truth, i.e. the Parmeshwar (Almighty) throughout the journey. And the quest for this truth is the quest for God, the attainment of joy and that is not possible unless this journey is full of love. The “Prem-Pravas” is the one and only path to a self-sufficient and contented journey of life. The “Prem Pravas” is no different from the “Maryaada Purushartha (path of discipline)”. 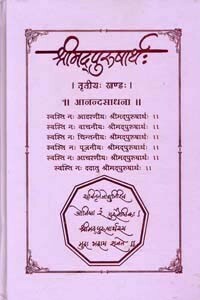 This second volume of Shreemad Purushartha progresses in three areas. (A planned orchard comprising of trees, which bear fruits that are “madhura“, the sweetness of which is very satisfying). The many ways of attaining happiness, which is available in abundance everywhere while making your way on the “Maryaada maarg(the path of discipline)” with love for God is Anandasadhana. The “Satya Pravesh” and “Prem Pravaas” guide every living being by holding their hand, to make their life most beautiful and efficient, while the Anandsadhana enables their efforts to get divine help. Sadhana does not mean any strict, rigorous act. It is an effort to connect the Parmeshwar’s Astha-Beej-Aishwarya and the Parmatmaa’s Nav-Ankur-Aishwarya, in order to get the Nav-Vidha-Nirdhar into one’s life successfully. When you sincerely yearn, the three paths of the “Satya-Pravesh”, “Prem Pravas” and “Anandsadhna” unite and complete the human life, whether it is a requirement in an ordinary family life or a necessity on a spiritual level. Every Thursday, the original copy of the Shreemad Purushartha Granthraj is taken to Shree Harigurugram. These are taken to the main stage in a palanquin along with a Dindi(procession). Every shraddhavan bows down in reverence before the Shreemad-Purushartha-Grantharaj. Where can we find the Shreemad Purushartha Grantharaj? 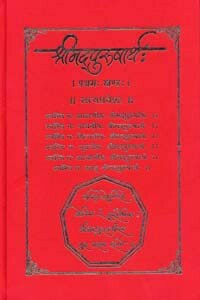 The three volumes of the grantha are available at Shree Harigurugram and online on e-aanjaneya.com as well.